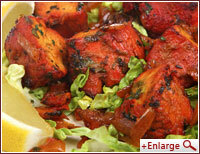 Chicken cubes marinated in spice and yogurt, grilled to make soft tikkas. 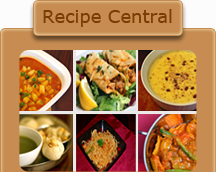 In a mixing bowl, whisk 1 cup yogurt,; add salt, red chili powder, ginger-garlic paste, lemon juice, garam masala (Indian spice powder) , add in the chicken cubes and mix all together and cover and refrigerate for at least 5 to 6 hours. Heat oven to 375 degrees temp, take skewers, arrange the marinated chicken cubes on to skewers, place the skewers on the grill rack of the oven, and grill them for about 20 to 25 minutes with a tray underneath. Allow chicken to cook till the inside of chicken is white and well cooked and the surface appears browned Serve with mint chutney.